The ruins of the 14th-century castle De Haar laid the spadework for this neo-gothic fantasy care of restoration architect Pierre Cuypers and heritage champion Victor de Stuers. New and replaced parts were freely inspired by the Middle Ages, the contrast in brick distinguishing old from new. Besides having his castle restored to its original lustre, the client, the fabulously rich baron Etienne van Zuylen van Nyevelt, wanted it to have modern conveniences. Boasting 200 rooms and 30 bathrooms, the castle was fitted out with running hot and cold water, central heating, electricity and a lift. 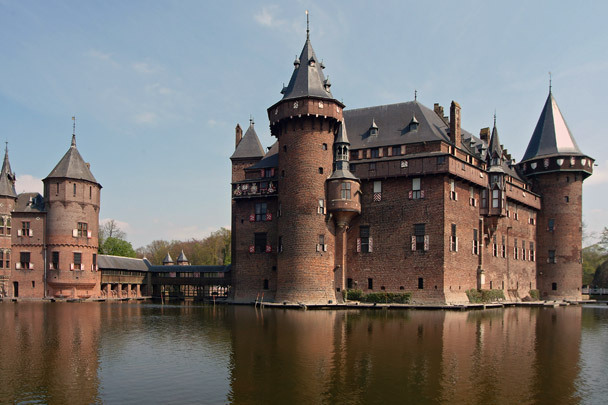 In order to reconstruct this fairytale castle and park, the nearby village of Haarzuilens was pulled down and rebuilt more to the east in mock-medieval style.